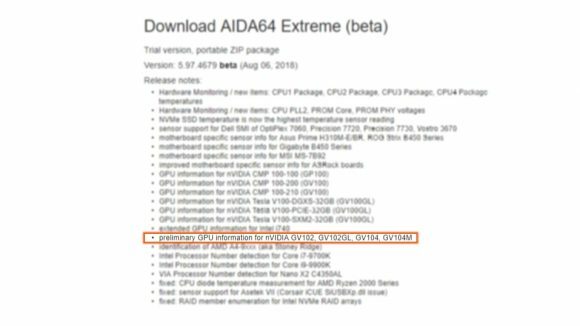 August 8, 2018 This story has been updated with Finalwire adding Volta GPU information to its AIDA 64 benchmark software. Some new Nvidia Volta GPU support has appeared in the latest AIDA 64 and HWInfo changelogs, detailing both GV102 and GV104 graphics silicon. The diagnostic software prodcuts have been updated to detect the new Nvidia GPUs, but the most interesting thing is that they’ve been giving Volta designations as opposed to the Turing naming scheme many people had been touting. 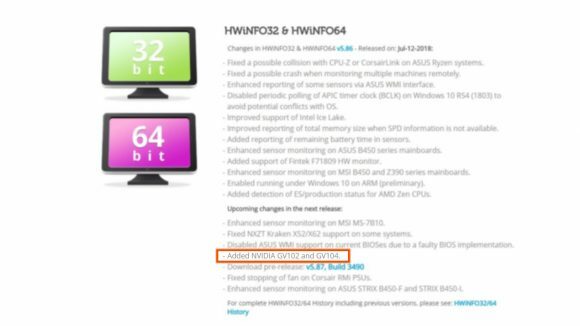 There are no extra details being offered by the changelog, but given that the two new GPUs are following the same naming scheme Nvidia has been using with the Pascal generation there are some things we can glean from the names alone. First there are new cards on the way pretty soon, and second that they’re both high-end options. HWInfo previously added support for new Volta-based graphics cards back in November 2017, just a month before the launch of the Titan V. With GV102 and GV104 GPUs being detailed now it’s not much of a stretch to believe there might be a similar month’s gap between now and the final launch. 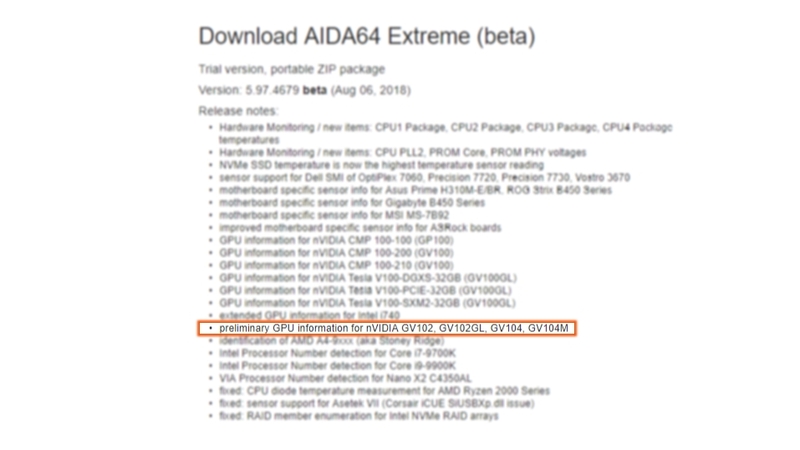 AIDA64 has now gone further noting GV102GL and GV104M parts too, potentially suggesting a Quadro card with the GL suffixed chip and a mobile version of the GeForce Volta chip. In Nvidia passim the 102 and 104 GPU designations have been used to describe a slightly cut-down version of the full-fat graphics core – exemplified by the GP102 used in the Titan Xp and GTX 1080 Ti – and the first consumer-focused cards in a generation. The GTX 1080 and GTX 1070 were both launched with the GP104 GPUs as the vanguard of the Pascal generation of GeForce graphics cards. It’s unlikely that Nvidia are going to be dropping a fresh Titan or GTX 1180 Ti straight away, however. The GV102, mentioned in the AIDA64 and HWInfo changelogs, is more likely to be going into one of the updated GDDR6-powered professional cards that will inevitably follow the super high-end, HMB2-toting Tesla and Quadro GPUs. The Volta-based codenames are also especially interesting in the face of some EEC certifications detailing Nvidia graphics processors with the GA104 and GA104-400 designations. That would seem to indicate that the company is using the officially unannounced Ampere GPU technology for its consumer parts. 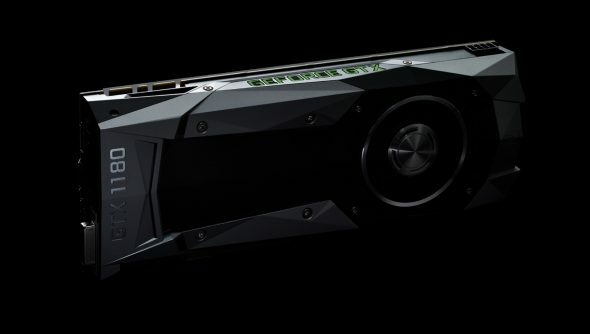 But with no genuine details on the new graphics hardware coming from Nvidia itself it’s hard to take either of these details as solid confirmation of the codenames for the next generation of GeForce GPUs. Until we get the cards in our hands at Gamescom this month I’m still taking everything we hear about names with a large spoonful of salt. Helps the rumour medicine go down, as Ms. Poppins used to tell me. Nvidia launched the Quadro P6000 with a GP102 in October 2016, while the GTX 1080 Ti didn’t follow until March of the following year. It had already released that generation’s Titan X by that point, but as the standard consumer cards – the GTX 1080 and GTX 1070 – had already launched a few months early that wasn’t exactly unprecedented. The 104 level GPUs will be the graphics chips to power the GTX 1180 and GTX 1170cards, and we’re probably looking at CUDA core counts somewhere in the region of 3,584 and 2,560 respectively. It’s interesting though that the AIDA64 and HWInfo details suggest we’re getting Volta-based GPUs for the new cards when most people had already jumped on the Turing bandwagon. It had always seemed strange, when the vague Turing rumours first surfaced, that Nvidia would announce and launch a whole new GPU architecture with a consumer card. It’s possible Turing will be some sort of sub-class of the Volta architecture designed for the consumer cards, but it’s looking more likely that it’s either a future architecture or simply nothing at all.